New release Digital SD-HD AV Mixer has two Input 'Bus', with six video inputs on each. 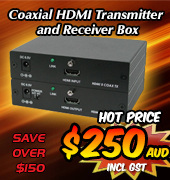 There are 2 x HDMITM’s (HDMI), 2 x Component (HD), 2 x S-Video (SD) and 2 x Composite video (SD) inputs on each 'Bus'. 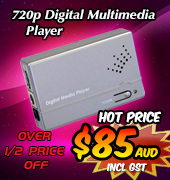 The output ports are 1 x HDMI for connection to an LCD monitor, 2 x Component, 2 x S-video and 2 x Composite video, one for connection to a monitor for 'SD Preview' and the other for connection to a recording device or TV. 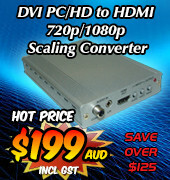 Compatible output resolutions are HD-SD NTSC, NTSC-4.43, PAL, PAL-M, PAL-N, SECAM, 480i/p ~ 1080i@50/60Hz only.